The US Climate Reference Network, USCRN, is the focus of my efforts to track continental US atmospheric (near-surface) temperature trends, as published earlier (see link) for the decade 2005-2014, inclusive. This network of temperature measuring stations is far from cities, factories, and other artificial warming (or cooling) effects; they are located in sufficiently pristine areas that human influences are non-existent or negligible. The year 2015 was, of course, one in which an unusually strong El Niño occurred. The El Niño was expected to increase surface temperatures across the US as it also warmed much of the Pacific Ocean surface. The adjacent chart shows (in orange) the resulting temperature anomalies for what I refer to as the USCRN 55, for the 55 locations that have data that extends back to January 2005. Note that the USCRN stations are relatively new and many of the stations came on-line in more recent years. It is inappropriate to include short-duration records with those of longer durations, as it skews the results. The chart also shows (in blue) the temperature anomalies from NOAA's "climate at a glance" web site, see link, It can be seen that both sets of anomalies closely correspond, but there are some significant differences. First, the similarities. Both show a warming for 2015, as expected from the El Niño. However, the 2015 result is not the warmest, as 2012 was warmer. The anomalies are essentially identical for the years 2008, 2010, 2011, 2012. 2013, and 2014. Next, the differences. 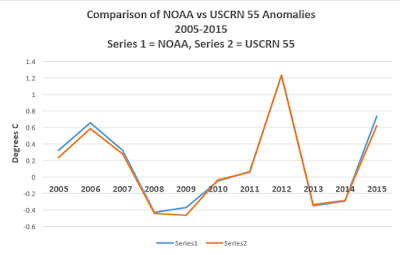 It can be seen that the NOAA data are somewhat greater for the five years 2005, 2006, 2007, 2009, and 2015. 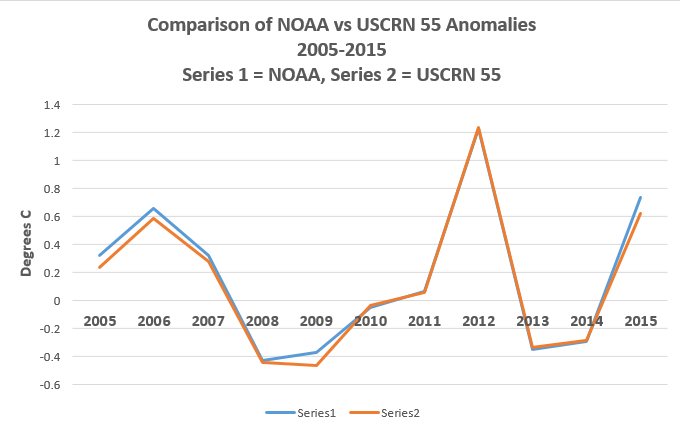 This is exactly what I, and many like-minded people have stated all along: the NOAA data shows warmer results when compared to the pristine, USCRN results. This is certainly true for the brief period for which the USCRN has data. What is also true is the NOAA data is consistently cooler in prior decades as a result of systematic adjustments. A note on the NOAA data, from their website: "Data for the Contiguous U.S., statewide, Climate Divisions, Climate Regions, National Weather Service Regions, and Agricultural Belts come from the U.S. Climate Divisional Database, which have data from 1895 to the present." This has the data from thousands of US locations, as adjusted by NOAA. Future results are very likely to show a cooling, and a rapid cooling as the El Niño converts into the La Niña mode. What is known from recent history is the small sunspot cycle Number 20 peaked in approximately 1970 at 100 sunspots. As that cycle came to its minimum, very cold winters occurred in 1977, 1978, and 1979. (see below for typical description of those winters) Presently, sunspot cycle Number 24 is also trending down after its peak of approximately 95 sunspots. over 77% of the state, and lasted 56 hours. northern Illinois." -- Illinois State Water Survey, 1980 "Illinois Third Consecutive Severe Winter: 1978-1979," by Changnon, Changnon, and Stone. The USCRN pristine sites are the ones to track. There is no need for adjustments to that data. The pristine sites are very likely to show substantial cooling in the coming years as El Niño fades, the sunspot cycles weaken, and any carbon dioxide in the air simply fails to deliver the warming that False-Alarmists claim. CO2 is not a significant component of AGW based simply on primary thermodynamic and transport laws that ANY competent chemical engineer should know and be able to deduce. Add the water vapor content of all areas of the earth, and you find that it almost always dwarfs the CO2 volumetric concentration (see Beer-Lambert law of Absorbance). Where water is scarce, you find that the daytime-nighttime max-min temperature differences are nearly twice those of typ of 50% Rel Humidity locales, which should indicate the relative importance of water vapor as opposed to CO2 and all the other GHG's. Then we can look at the temperature anomaly-CO2 x-y plots for the last century, we find the data show y correlates poorly with x, particularly in the last 18 years. An r-squared of <0.4 does not portend a sustainable feedback control relationship that makes any sense. Other things are obviously responsible for the climate change as it historically and currently exists. Then we can look at the AGW establishment (who think calling "climate change" makes them non-biased)and their overt manipulation of reasonable if somewhat variant data to "prove" their models accurately predicts the behavior of their basic theory that CO2 holds, even creates, an additional energy alloquot into the plantary energy balance. First law of thermo ?? Statistical mechanics ?? They only give cursory coverage in these areas to climatologists, oceanographers, and most physics degree programs. We have a tremendous amount of true variance in real climate data, especially solar insolation cycles, to adequately account for about all statistical average thermal anomalies. This has been the case through several historic hot and cold cycles. Pete Nick is a chemical engineer, co-inventor and patent-holder of U.S. utility patent 7,452,392, issued in 2008 to him and his team of four other Southern California chemical engineers. The '392 patent describes a "reactor and a process for the conversion of organic waste material such as municipal trash, sewage, post-consumer refuse, and biomass to commercially salable materials." - quote from the '392 patent's abstract.